Garry Lo is an explosive player who is bound for greatness, says his club coach Mark Aston, who is also coaching the Irish Wolfhounds at the 2017 Rugby League World Cup. Aston, who coached him in the Sheffield Eagles in the Kingstone Press Championship, is now the assistant coach in Lo’s Super League Club Castleford Tigers. He was impressed with Lo’s performance. “I got a fondness for Garry (Lo). He took me to the Black beach (Gaire) the other day, which is a fantastic, place. “He is a champion. It was bit of a challenge when he first came. He wasn’t in the shape he should be but there is absolutely no doubt about his ability. He is a super star in the making. There is no doubt about that … he is big and explosive,” Aston said. After the match Lo was thankful of Aston and his coaching, adding that he has been a good coach. “Yes, I have known him (Aston) for three years and I have played under his coaching. He is a great coach who shared his experience with me and taught me some good skills as a winger. I upset him but it is a game. 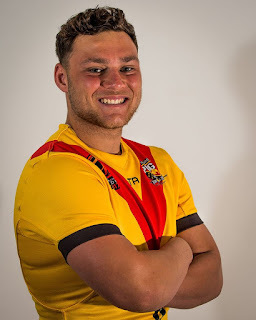 “Mark Aston is the assistant coach of the Castleford Tigers so we had a chat and he said I need to go back as early as possible to travel back in December and join the pre-season warm-up matches and training. It’s the Super League so I am looking forward to playing at the highest level of rugby league in Britain,” Lo said. “First of November was my birthday and I said I had to put a try and celebrate my birthday…yeah! it means a lot to me scoring that try.